Self-published Nov 2017 by Donnelly. Available to purchase online in paperback, via Booktopia for AU$16.50. If you’ve been following the Just Write For Kids’ Books on Tour page, you might be pleasantly exhausted from the whirlwind that is author Anne Helen Donnelly, and her Ori’s Christmas Blog Tour. Last week was a great, fun launch (online and at Dymocks Sydney CBD), for the second in Donnelly’s Ori the Octopus series. I’m not going to even try to top that with my review but I’m keen to add my voice to the praise for this driven and en-pointe new author, whose self-published books have hit the mark with children’s librarians and bookshop owners. 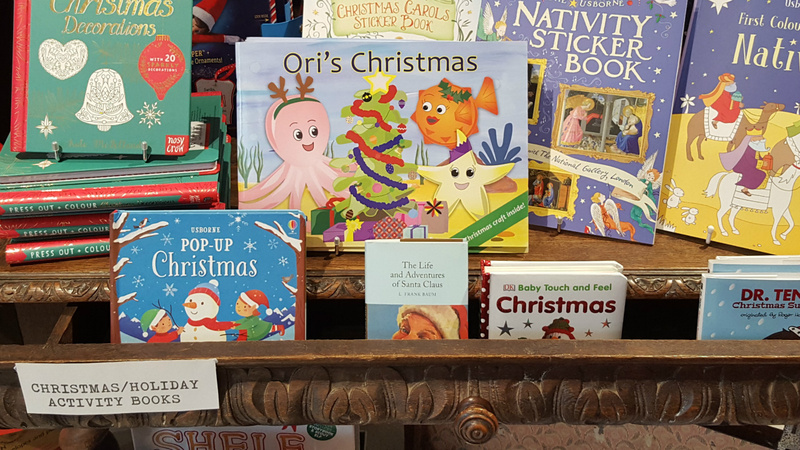 Following an astounding 49 author visits for her first book, Ori the Octopus, Anne is virtually booked out with live storytime activities for her new Christmas book, all over Sydney. See dates and appearances here. Born in Malta and moving to Sydney in childhood, Anne’s life has been interesting and full. She is a busy mother of two, who has likened her multi-tasking skills to an eight-armed octopus (ala her protagonist Ori). I’m sure many mums can agree with this sentiment! After moving on from a career in the health management, Anne has been inspired by motherhood to write stories and perform for children (as a children’s entertainer) and take her love of illustrating further, by training in Adobe Illustrator and Photoshop. We have these graphic design skills to thank for Anne’s beautiful fusion of hand-painted and computer drawn pictures, in the Ori books. The colours used and the expressions on the character’s faces are super engaging for adults, so I can only wonder at how children must see them. I know they captured my four-year-old son’s eye. But what of the book itself? I would sum it up for parents as a smart piece of publishing. If you are looking for a Christmas-themed book to put under the tree, Anne Donnelly’s offering matches it with bigger-named authors on bookstore shelves. It has beautiful production values, with glossy pages and a very cool, pull-out craft mid-section. This colouring and cutting activity comes with easy-to-follow instructions on how to make your own Ori Christmas decorations for your tree. As an author, Donnelly is all about interactivity for kids and her style promotes engagement and learning through play and fun, rather than didacticism. Ori’s Christmas follows the tale of Ori, a natural giver who invites his ‘under the sea’ friends to celebrate Christmas together. They are all keen but come with stipulations on how they want to celebrate for the day, making it a hard act for their kind friend Ori, to juggle. With so many conflicting demands, it’s easy to imagine Christmas Day might be a disaster but luckily, Ori has gentle powers of persuasion and helps his friends to recognise that compromise is the key to achieving a great outcome for all. The narrative is well-constructed and the learning process for the characters, is an example to little readers in working together for the common good. A nice message wrapped in child-friendly, Christmas fun. With its bright colours, use of bold shapes, read-aloud and ‘learn as you play’ qualities, Ori’s Christmas is a terrific book for 3 to 5-year olds. It has the pre-school demographic down pat and Donnelly works hard to make sure that she is out there meeting the parents and the kids, through live readings and book signings. The book also provides useful parent and teacher notes to prompt discussion points with your child. The author’s website is an extension of her books, with Ori videos and downloadable colour and craft activities. Very comprehensive Miss Donnelly and a model to other aspiring authors on how to market your children’s books. I will be watching the ‘Ori space’ with interest and look forward to the next instalment in the series in 2018. Follow Anne Helen Donnelly on Facebook.